John R. Wilcox, theologian and professor emeritus of religious studies at Manhattan College in Riverdale, NY, recently published a book outlining the challenges Catholic colleges and universities face with diminishing numbers of clergy members on campus. Revisioning Mission: The Future of Catholic Higher Education focuses on the need to form on-campus “mission communities,” which Wilcox describes as diverse groups of faculty, administrators and staff committed to preserving the culture and heritage laid down by the founding religious congregations of Catholic colleges and universities. The book details the culture, intellectual life and adult spirituality of the religious congregations that helped to found Catholic institutes of higher learning. It also profiles the spiritual lives of students. 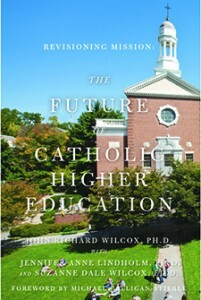 Peter Steinfels, co-director of the Fordham Center on Religion and Culture, called the book a “concrete proposal for action.” Jennifer Anne Lindholm, special assistant to the vice provost for undergraduate education at the University of California, Los Angeles, and Suzanne Dale Wilcox, a spiritual director, were special contributors to the book.